We’ve slowly been knocking out peaks and ridges in the Ko’olau Mountains. In order from East to West, we’ve completed Kuli’ou’ou (twice), Kulepeamoa, Hawaii Loa, Wiliwilinui, and Mount Olympus (If you’re interested, you can view a map of every hike we’ve done on the island here). 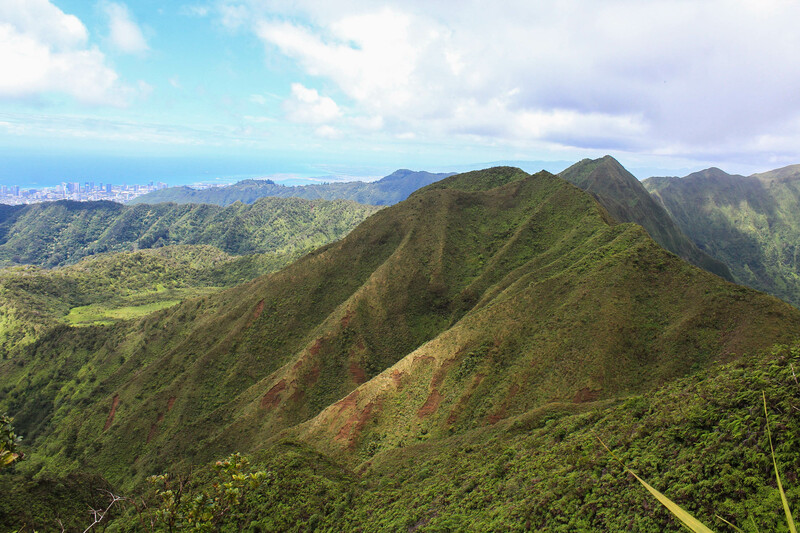 The peak that seemed to be the logical “next step” with our level of hiking was Lanipo Ridge, AKA Mau’uame Trail. Lanipo Ridge/Peak falls between Wiliwilinui and Ka’au Crater trails, is 6.5 miles, and is known for having plenty of ups and downs while hiking the ridge to the summit. It had actually been a while since we’d gone for a longer hike or conquered a higher peak. Our weekends over most of August and September haven’t been as adventurous as we’d like, with other things such as fixing the car, DIY house projects, hurricane/tropical storm warnings, and more car issues demanding our attention. 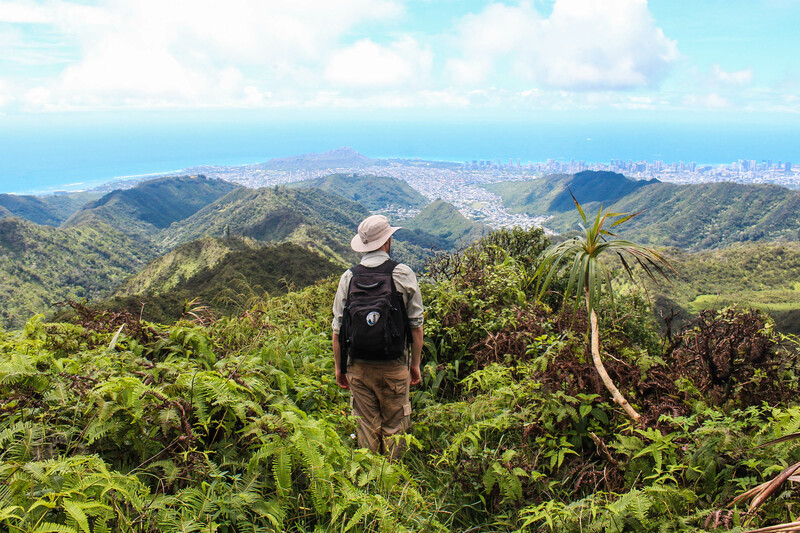 However, we have some pretty big hiking goals we’d like to accomplish while living in Hawaii, and we know we need to be in excellent shape in order to achieve them. The result of needing an exciting new adventure and feeling motivated to get in shape led to us deciding to hike a more challenging peak on a rather hot day. We began our hike around 8 on a weekend morning. The trailhead begins off of Maunalani Street at the end of a steep uphill drive. It reminded me of Wiliwilinui and Hawaii Loa trails, and at first it made me think that we wouldn’t have as much elevation to gain — but I was wrong about that. After a short and steady uphill stretch between two fences, the trail drops down 600 feet in the first half-mile. Next comes regaining all that elevation, and then some — and that seems to be the theme of the entire trail. One could think of it as a nuisance, but an optimist might see it as a chance to be constantly going back and forth between working out different leg muscles. The choice is yours! Regardless of whether you view Lanipo as a glass-half-empty or half-full situation, the truth is that there is no “easy part.” It took us the same amount of time hiking back as it did hiking up to the peak. Also, looking at our recording on AllTrails isn’t as exciting as I expected it to be — I thought it would look much more dramatic with all those ups and downs. 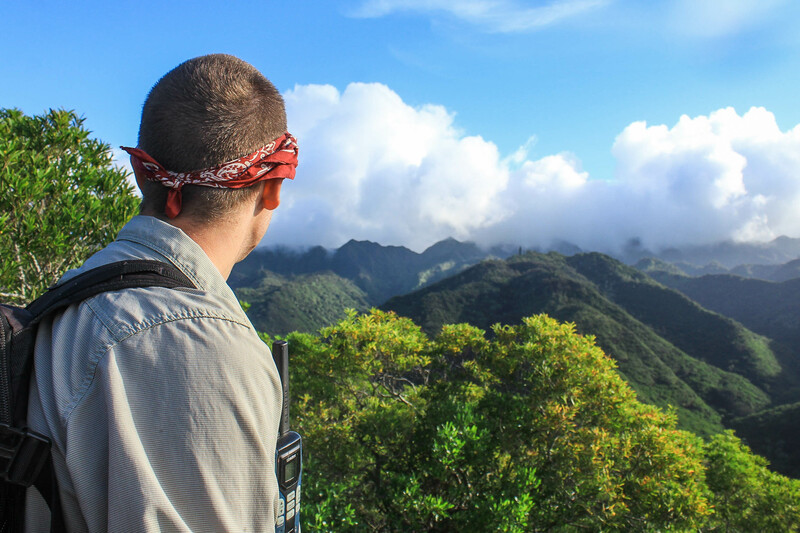 When we began our hike, we could see the Ko’olau Summit covered with clouds in the distance. Normally this would disappoint us, but today we were eager to reach that part in the trail. Clouds meant getting out of the hot direct sunlight. The trade winds were basically non-existant this weekend, so we relished every breeze that came across the ridge. Another challenge that Lanipo Ridge Trail presents is that it is extremely overgrown. Thankfully we read about this beforehand and prepared accordingly: Instead of wearing my usual outfit of shorts or exercise clothes, I went with the much more practical and extremely fashionable choice of Curtis’ cargo pants. Unfortunately I don’t have a picture to show the world how amazing I looked, but perhaps next time we’ll get one — Yes, I’m sure there will be a next time, because they worked so well! 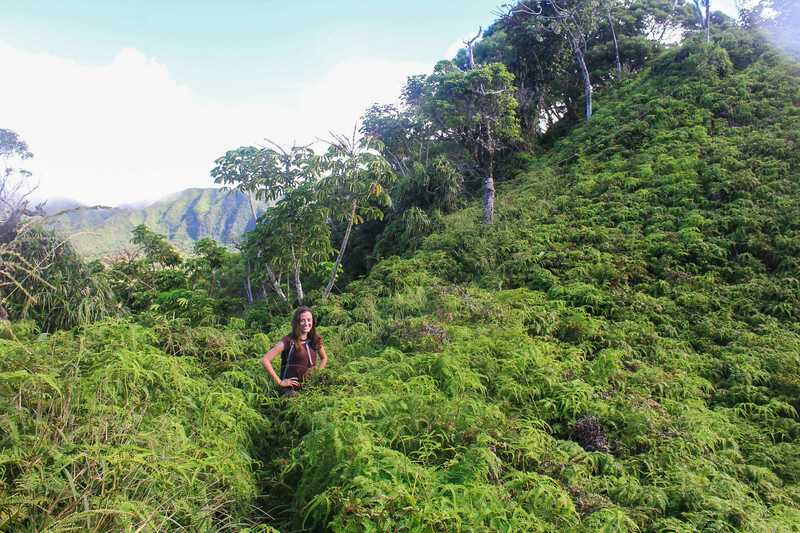 All that to say, if you’re hiking the Lanipo Trail, be prepared to walk through tall bushes on either side of the trail and uluhe branches that grab onto your clothes and scratch up bare skin. After all of these warnings, one may be wondering why anyone might subject themselves to a trail that is steep and constantly gaining or losing elevation, and is so overgrown that you can’t even tell if there’s a trail under all those weeds? Because hardly anyone else hikes it, of course! We only saw one other person on a weekend (Well, also a family as we were finishing, but given how hot it was I doubt they went very far). While we could still hear traffic, sirens, and car alarms down in the valley, we were very much alone for the majority of this hike. Despite the struggles and the sun beating down on us, we very much enjoyed this experience. 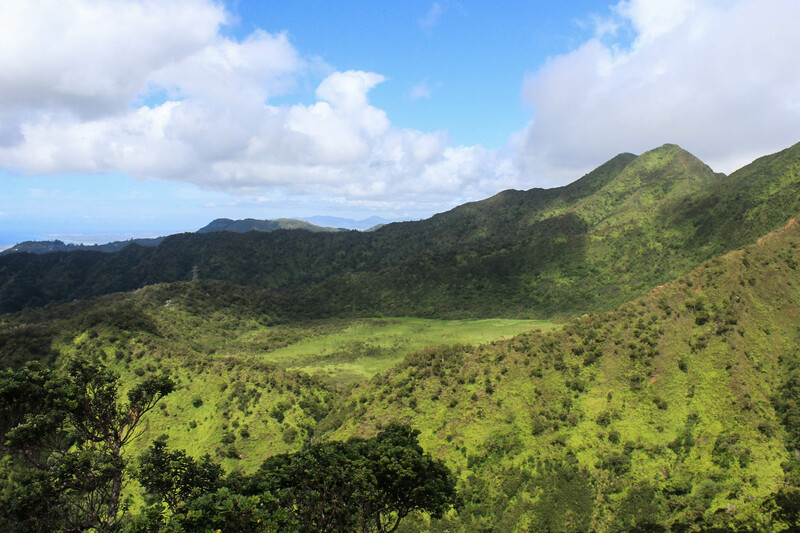 One of the aspects of Lanipo Trail that I had been most looking forward to was getting a look into Ka’au Crater. 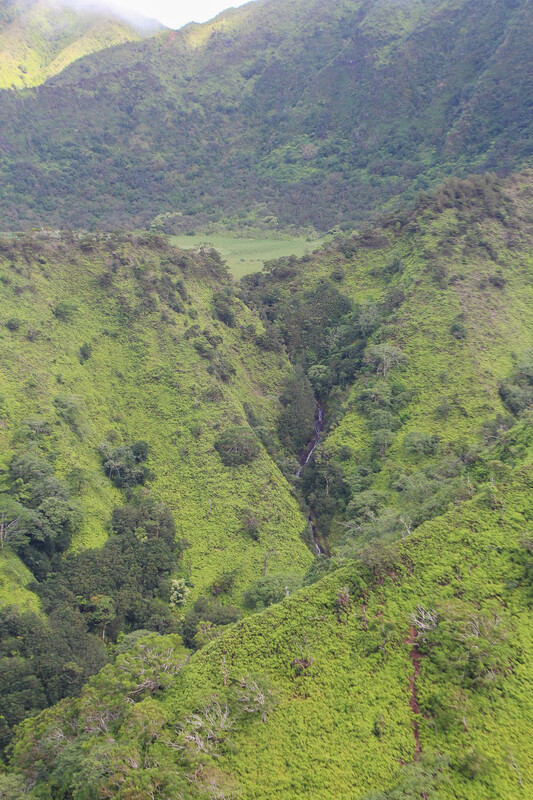 Not only were we able to overlook the entire crater, but we also saw the many waterfalls coming out of the crater’s marsh and down into the valley. There is a “trail” that climbs up all of those waterfalls, up to the Ko’olau summit, and around the entire crater, but I admit that seeing the trail from a distance has made me positive that I don’t want to hike it. I’m content with the view we had from the neighboring ridge! 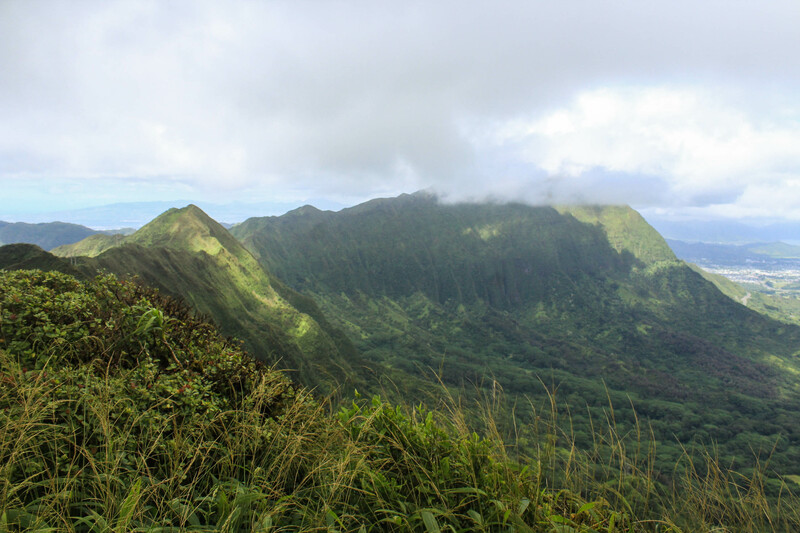 The final stretch up Lanipo Ridge was steep and exposed, but we breathed a sigh of relief once we reached the Ko’olau Summit. Honestly, we hadn’t been expecting much in the way of views — there had been clouds and even a little rain over the mountains earlier that morning — but we were rewarded with the best view we’ve had of the Windward side. We still weren’t able to see the peak of K1/K2, but the clear skies out over the ocean made the water bluer and the land greener than we’d seen before. We took our time at the peak, partially just enjoying the view, but also avoiding the hike back down. 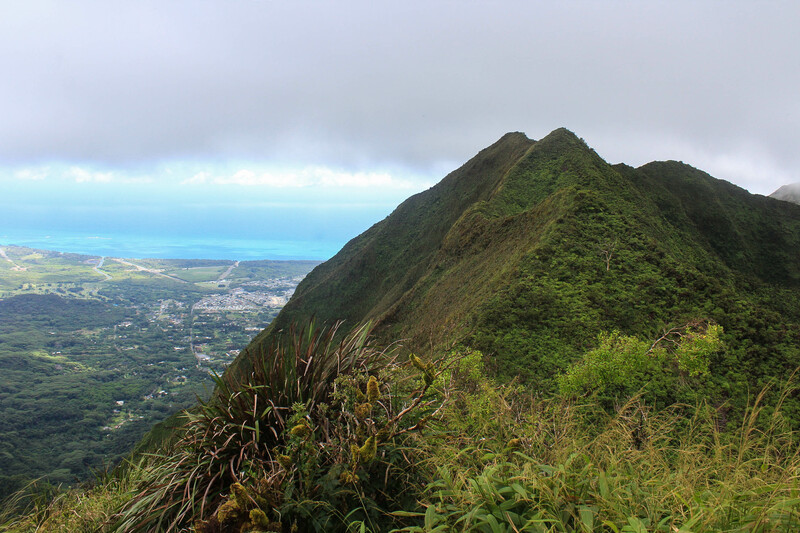 Technically, we didn’t reach the actual peak — in order to do that, we would have had to walk a quarter mile on the precarious, muddy, and overgrown Ko’olau Summit Trail to reach it. I saw it from a distance and knew I wasn’t interested in hiking it. I told Curtis he could if he wanted, but he agreed that it wouldn’t be smart. As we hiked up Lanipo Ridge, we had been wishing that we would have arranged a through hike with friends so that we wouldn’t have to descend the same trail, but knowing we’d have to continue on the KST longer, we realized it was smarter to return the way we came. Our return hike was slow-going, filled with water breaks and plenty of sweat, but it made finally reaching the end even sweeter. The 6.5 mile trail took us 7 hours to complete (counting all breaks and time spent at the top) and we consumed 6 liters of water throughout the entire hike (we always carry about 8 and rarely drink more than 2). 6 miles never seemed like a lot when we lived on the mainland, but here it feels like a big accomplishment. Hiking a mile an hour sounds ridiculous on mainland trails, but considering trail conditions and the hot Hawaiian sun, it makes more sense here. Hopefully we can continue to improve and conquer more peaks in the near future!